One would think that Dave and I are the people behind Bad Dog Distillery. That is far from the truth. There are many people behind Bad Dog Distillery. Without our friends' and family’s help we would not be able to do it. Dave’s good friend Mark Y. spent at least 2 solid weeks helping Dave build the tasting room. They even did the majority of the tasting room design. I think one of the conversations went, “the bigger the log beams the better”. And they are big for sure. Dave’s other good friend Marc T. has spent quite a few of his Friday and Saturday days off helping. Allan has been the “offsite-gathering-equipment” guy. He found Dave the boiler and coordinated the pickup. I think he also played part in finding us some doors. Son-in-law, Daniel, and his buddy Dave are helping with figure out how to get the boiler hooked up. My daughter’s best friend’s husband and brother-in-law helped with our sprinkler system. Dave even had a client come in and help with some architectural design ideas. Here's the logo that Fresh Bread Design did for us. We really liked it but it's the right decision to not use it. If you're curious, Google Bad Dog Bitters. I think you will agree. Here's a picture of the walls for the bathroom hallway. Not too exciting, but exciting for us. This is something we've been talking about for 9 months now. We are gaining momentum with the distillery. Last Thursday the TTB requested additional information for our permit. They wanted more detail on the layout of the interior and another drawing. I submitted that on Monday and got a phone call yesterday. I was told our application was going to be forwarded to final approval. We could potentially have our operation permit in a couple of weeks. 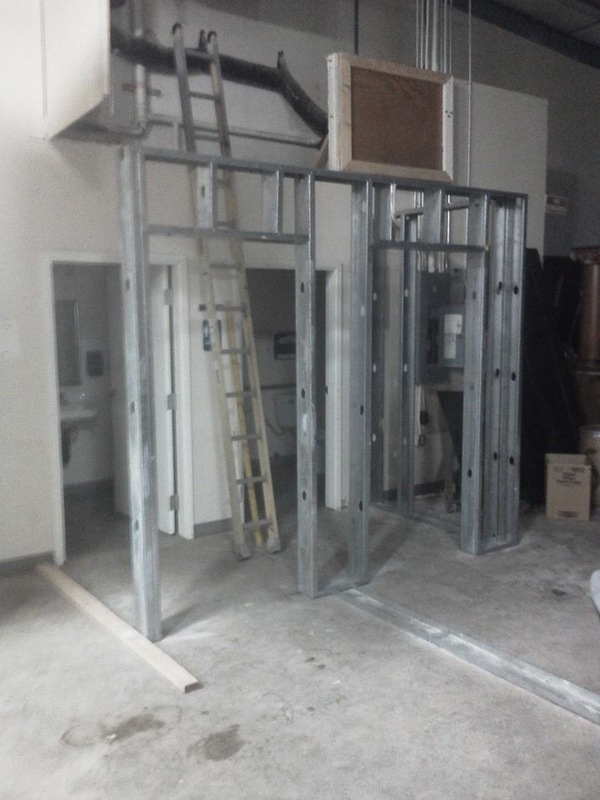 Dave is putting up the walls for the tasting room and the grain loft. I order internet and phone service and should have that by Monday. I bought a printer last night and will buy an iPad once we get the internet up and running. Probably the most exciting part of the week is the finalization of our logo. I posted 3 options on Facebook and got lots of good comments. We took those comments to create the final logo. I can’t wait to share it with everyone. Once I get the distillery’s office fully functional, which should be next week, I will work on an official Bad Dog Distillery’s Facebook page. And probably should figure out the Twitter thing too…. Dave and I wish all of you a fabulous weekend and thank your for reading Bad Dog’s blog. Next week I’ll be adding pictures to it. It’s hard to believe next Tuesday will mark the 1 month anniversary of the Oso landslide. Dave and I were at a distiller’s tasting event called Snohomish on the Rocks that day. I remember when Dave got the phone call from his friend, Guy. We both thought, “A mudslide. It’s happened before up there. No biggy.” After our event Dave called a buddy that lives in Oso and found out it was a very big deal and total devastation. From that point we both went into shock, grief and then how do we help mode. That Saturday night was the first opportunity to help. Dave got a phone call at 9:30PM from a client asking Dave to come and get his horse because their place was flooding. That seems like a simple enough request, but the client lives on the Darrington side. Dave and some friends had to make a 4-hour round trip to get the horse. She is now living with us. The following week Dave knew he needed to do more. He headed up to the Oso fire station dressed in his logging clothes and packing his chainsaw. He was put to work as a sawyer. He cut logs so the excavators could pick them up and move them. Homes were buried under these muddy log piles. The work was slow going. They needed more heavy equipment. By Thursday of that week Dave told me that he had to get a machine up there. He’s an operator, he can do more. He called a rental company and got an excavator dropped off at the site by either Friday or Monday—by now the days have become a blur. The rental fee is $2,000 a week out of our pocket. He spent the next couple of weeks operating the track hoe and working along with the FEMA group, which included his cousin Fred. Who would imaging that Freddy, a Seattle Firefighter would be working in a debris field with his cousin in Oso/Darrington. While Dave was working in the debris field I was helping organize a donation drive at AMT where I work. A co-worker had connections with the media and AMT became a donation drop off point. The donation response was overwhelming to say the least. We were so fortunate that the distillery was still empty. We took all the supplies for the worker to the distillery. We organized everything on pallets. It became a staging area to replenish supplies for the people working in the debris field. This kept me busy for 14 days straight. It’s been 3 weeks now. Dave and I are both getting back to our normal routine. Tuesday was his last day on the site. It’s time to focus on the distillery again. The Monday after the slide I submitted our paperwork for the Distilled Spirit Plant permit to operate. This was a huge accomplishment. We also opened a bank account at Coastal Community bank. I would say this completes phase 1. Next on our list is Dave has to get the plant set up. We have about 3 months before we could potentially have our TTB inspection. I will be working on our brand strategy and labels. After that we will work at creating a website and social media pages. So stay tune for our new logo…. Patience…. My lifelong lesson. Dave and I are patiently waiting to hear from the bank. I had to call them on Monday because it had been over a week since we submitted our paperwork. It’s a good thing I did because John said, “Well I’m waiting for paperwork from you.” That paperwork he was waiting for had been sitting on his desk for a week. He forgot. John said he would get right to work on it and we will know something by Wednesday, which is today. I thought I had the bond all finish. Well actually the bond is finish, but in the wrong amount. Last Thursday I received the bond in the mail and then Friday afternoon I came across a worksheet that said we needed the bond coverage amount to be a minimum of $15,000. Our bond is only $10,000. When I started working on the bond all I could find is documentation saying it had to be at least 90 days worth of taxes that we would owe. At this point I’m not sure if we can change the bond. My awesome insurance gal is working on it for me. However, yesterday I came across another statement on the TTB website that said if your bond is not in the minimal amount you must fill out this other paperwork. So that leads me to believe the $15,000 is not a must. We’ve heard the TTB paperwork can be a challenge. I see why now. Other things in the working…. Dave has lined up a boom truck to get the silo from Sumas. He also has a number for a milk tank that’s in Sumas. We filed for a tenant improvement permit to build our tasting room. The city was extremely helpful and they are eager to see us open. I’m working at filling out the TTB form for the plant permit. There are a lot of questions that leaves a person guessing at what do they really want to know. Such a “Describe each tract of land covered by the distilled spirits plant by using directions and distances.” Oh the fun…. Have a wonderful week. I hope to be giving you good news about our funding in the next blog. Many times things happen that people just blow off as a coincident. I always see these as something that’s meant be. Sometimes I try to analyze why but more often I accept them and thank the Lord for the small blessing. Last week Dave had his hernia surgery. While most of us see this as an unfortunate event, it turned out to be really good. Dave was forced to stop doing manual labor for while. During his down time has was able to really focus on his distillery projects. This week Dave met with the city of Arlington’s building official. The guy was very helpful and told Dave we shouldn’t run into any problems with the city. He was also very excited to have a distillery coming to Arlington. Dave also finished the drawings of the plant and tasting room which is a requirement for the DSP Permit. He made several phone calls to gather resources for his still builds. Yesterday he made an appointment with the bank and got our lease agreement. So….. his hernia operation was a blessing in disguise. So much progress was made this week!!! Good morning, Did you know there are two different types of spirit distillery licenses in Washington State? They are the Standard Distillery License and a Craft Distillery License. The Craft Distillery License is limited to producing 60,000 gallons of spirits a year, their annual fee is $100 and they can offer free on-premises tastings. One of the biggest drawbacks for a Craft Distillery is 51% of their raw material must be Washington State grown. Another drawback is they can only sell up to 2 liters of their spirits from their tasting room. The Standard Distillery license’s annual fee is $2,000, however there isn’t a limit on how many gallons they can produce or where the raw materials come from. Other than the cost the only other disadvantage for a Standard Distillery is they can’t offer any tastings on premises. Bad Dog Distillery will be a Craft Distillery. One of the main reasons we chose to be a craft is we want a tasting room. We want our community to visit and learn about our distilling process. We want to share some of the moonshine and our nation’s liquor history. And we want to give you a free taste of a product that we are proud of.